My friend Catherine wrote me with a strange ingredient; her and her mother love duck and needed a recipe. They had previously made a whole duck and were disappointed at how much it shrunk during cooking. So they thought they would try duck breast this time. I'm excited to make a recipe for them, I love duck as well and haven't worked with it in a while. One of the keys to cooking duck breast is is to cook it slowly, skin side down so that you render the fat....essentially you are cooking down that layer of fatty skin and then turning it crispy. If you cook this too fast you'll end up with t hat chewy or slimy-like texture that keeps many people from eating duck. As with any meat, always remember to let it rest for at least 5 minutes after taking it off the heat before you cut into it. This will help all the juices redistribute and stay within the meat and keep it moist. The other part of this meal is the fruit ravioli. 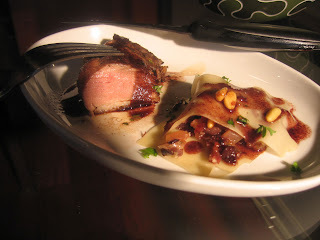 Cherries go so well with duck and with it being summertime, I didn't want a heavy side dish, which ravioli tends to be. So I created a fruit compote filling which is fun, light and real tasty with the duck! The use of Wanton wrappers instead of pasta dough makes it really easy to put these raviolis together - so you have no excuse not to try these! You can make these ahead of time too, so the timing is easier. Cat -I hope you like this dinner - let me know how it works out! Treat yourself to a special dinner tonight - you're worth it and deserve to be fat and happy! Season the skin side of the duck with salt and pepper, then place in a pan over medium lo w heat, skin side down. This is going to cook for around 15 minutes, periodically pour off the fat as it starts to gather in the pan. The skin should be looking dark and crispy. 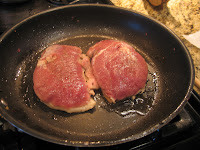 Then you will flip the breast over and cook them with skin side up for 2 to 5 minutes, depending on your taste. I like my meat more on the rare side so I only cooked them for about 2 minutes at this point. Season with salt and pepper. Leave them in longer if you like your more done. Don't cook too long or the will get dry! Take the breasts out of the pan and set aside, loosely cover with tin foil. Empty any grease in the pan. Now add 1/2 to 1 cup of red wine to the pan and place over medium high heat. Let that simmer until it begins to thicken. (if you're making the ravioli - add them to boiling water at this point, they only take a second to cook) Whisk in 1 tablespoon of butter and your sauce is complete- it's that easy! Pour over the duck and enjoy! If you want to make the sauce more cherry -like, you can substitute port for the wine, which will give you a deeper, richer sauce, or add some chopped cherries to your wine while it's reducing. That's the filling. Now we just need to assemble the ravioli. And there are two options here - make open ravioli or closed. The pictures above show each version; the difference is the closed ravioli you can make ahead of time. The open is assembled moments before serving. While many people think the closed ravioli is daunting, I think it's easier because with the open version you need to work with hot noodles. But I think the open is a pretty presentation. Add wanton squares to boiling water, they only need a minute to cook and will float when done. Drain. Place one square on your plate, add a scoop of the cherry filling, top with another wanton square. 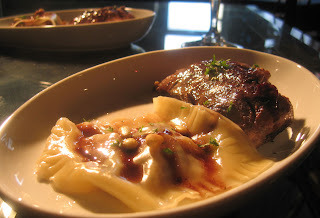 Top with toasted pine nuts and Manchego cheese, and a drizzle of the red wine reduction. Layout the wanton squares, one for the bottom and one for the top. 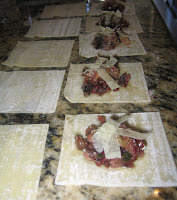 Place a scoop of cherry filling on one square, top the filling with Manchego cheese. Dip your fingers in water, and run them along the outside of the square - now place the top square on the bottom and press all the edges together. I like to also fork all the edges to ensure they are sealed. Simply take a fork and press along all the edges with the end of the fork. Place these in boiling water - again they only take a minute to cook and will float when done. Drain, place on your plate and top with toasted pine nuts and a drizzle of the red wine reduction.